I LOVE this giraffe. It is so unique. Stands tall and proud !! 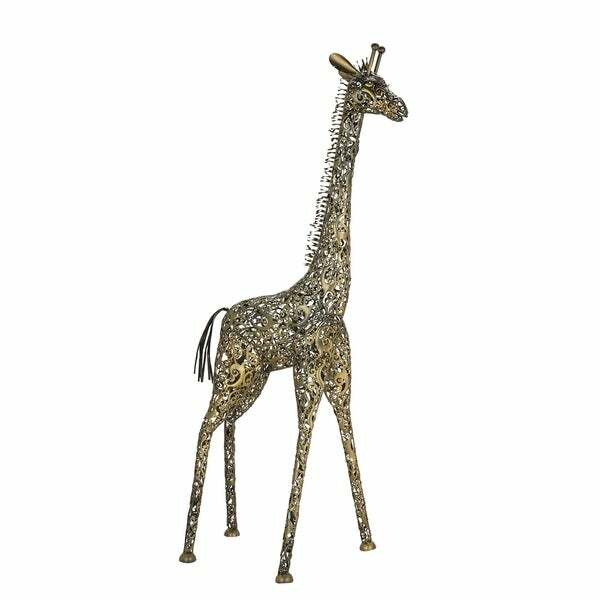 Bring a playful accent to your garden setting with this charming faux giraffe sculpture. It features a stylized imitation of a standing giraffe designed with pierced scroll details. Donning a unique look and an alluring gold finish, it easily blends with both eclectic and modern-themed setups. This sculpture is crafted from 100% iron material and is guaranteed to last even when exposed to rough conditions. Get it now at a price that won't hurt your pocket! Dimensions 25.0 In. X 43.0 In. X 89.0 In. "Will this rust if left outside in the rain. Does your guarantee cover rust in the first 2-3 years?"